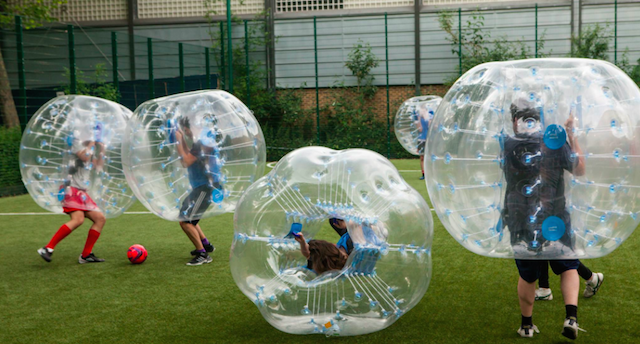 Bubble Football guarantees a lot of laughter and a lot of bumping. You will enjoy yourself so much, you will think you’re a kid again. Once the whistle starts everybody flies straight in, there’s a lot of bumping, bouncing, rolling and laughing especially from the spectators. You and your friends will be laughing for days after. 1,Bubble football requirements the site has no sharp objects, carpet to common ground or cement ground. 2, prohibit carrying keys, mobile phone, glasses and sharp trinkets to play. 3, the use of products should be checked before the seal is intact, and securely handle strap. 4, please according to the product on the “up” tips, not to reverse the use of. 5, should play back strap, hold the handle. 6, children play with parents should care. 7, suffering from heart disease, high blood pressure and weak constitution are not used. 8, rain, more than three winds prohibit the use of. Bubble football started in European countries are particularly popular, and now has gradually entered China, Taiwan, Beijing, and other cities, people in the play. Maybe you do not know what bubble is a football, do not know bubble football how to play, it doesn’t matter! You can contact us, we will tell you in detail, when you know the bubble football, you will be crazy in love with bubble football!